Of all my clothing catalogs from 1890 to 1960, maternity clothing is limited to just 2 or 3 pages. Lane Bryant had the only mail order clothing catalog to specifically cater to maternity wear. She had a very hard time even getting for maternity clothing. She turned to catalogs and had better success. 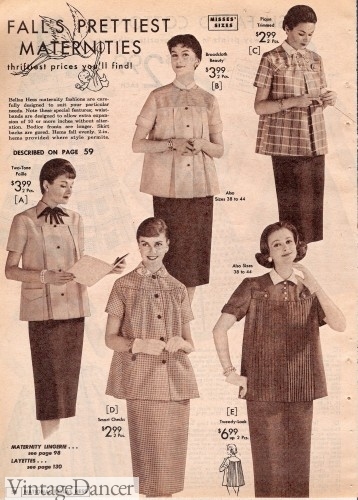 Soon other catalog companies copied her, and some department stores carried ready-made clothing and patterns (although women had to ask for them.They were not on display.). For some more pictures of vintage maternity clothes, check out these articles and .